Newt Gingrich’s moon colony and Mars plan. Newt Gingrich described himself as a visionary when he unveiled plans Wednesday to create a mammoth new space program, including a permanent colony on the moon within the next nine years. Within eight years, he pledges a new Mars rocket program—specifically, a “continually operating propulsion system) capable of getting to Mars within a remarkably short time.” He also reiterated his plan to declare at least part of the moon as U.S. territory, with colonists capable of petitioning for statehood status. There is little doubt that Mr. Gingrich believes in big ideas. Unfortunately, however, there is a difference between big ideas and good ideas. After all, being a visionary doesn’t mean abandoning practicality altogether but rather harnessing it creatively to make new things happen. Put aside that Gingrich was speaking in Florida, the state most invested in space exploration and, by happenstance, the next up on the Republican primary schedule. Let’s consider cost first. The Apollo missions to the moon cost in excess of $100 billion in current dollars. In 2005, NASA administrator Michael Griffin estimated the cost of a program to land four astronauts on the moon by 2018 (as was then planned), at $104 billion. Now, four astronauts is not a permanent colony on the moon. To have a permanent colony, you would have to manufacture housing, most likely underground, or at least under significant shielding, since there is no atmosphere and no magnetic field to shield against the harmful effects of cosmic rays for an extended period. Not to mention the need to build facilities for waste recycling, plus food storage and preparation. That is, unless we continually provide food and other provisions for pilgrims from Earth, creating a non-self-sustaining colony. But Gingrich has already made it quite clear, in his attacks on President Obama, that he would not like to be remembered for championing any such sort of government-sponsored food program. So, to truly embark on such an endeavor within a decade, we would have to spend somewhere between a few hundred billion and a trillion dollars. Whether we could develop the necessary technology for such a task within a decade is an open question, although for a sufficiently large investment, it might not be impossible. However, Gingrich is vying for leadership of a party whose major rallying cry is an end to big government programs and make-work projects to stimulate the economy. 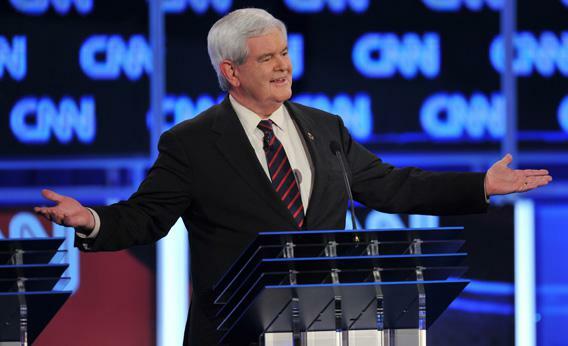 Gingrich might argue that we need not rely on government for the investment. However, without a clear business plan, it is hard to imagine private money investing $1 trillion in a program with no clear commercial goal. Yet he did not explain precisely what he wanted to do with such a colony, or what it might achieve, besides potentially populating a new 51st state. Certainly the goal would not be a scientific one, since there is little scientific gain to be made that would justify the cost, and one could populate the whole solar system with unmanned spacecraft that could explore all the planets and their moons for this cost, as well as send up satellites that could map the heavens on unprecedented scales. So is manufacturing his goal? But what would we manufacture on the moon that we could not do on Earth for a fraction of the cost? It is true that there may be significant otherwise terrestrially rare isotopes like helium-3 in the lunar soil, and some have argued that this would be useful for fusion power here on Earth. But since we don’t yet know how to produce fusion power on Earth, it seems a little premature to rush out on a trillion-dollar adventure to gather up potential fuel. Perhaps we could put mirrors on the moon to beam sunlight to Earth for power. But given that currently 10,000 times the total energy used by humanity on a daily basis falls on the Earth from the sun, it is not clear that we need to go to the moon to harness more of it. Gingrich also said during this same address that he envisions a vibrant commercial near-Earth space program for the purposes of science, tourism, and manufacturing. Once again, he didn’t bother to explore precisely what sort of program one might envisage here. It took more than $100 billion to manufacture a white elephant in near-Earth orbit called the International Space Station, a large, smelly metal can that to date has produced no science, no manufacturing, and tourism that only billionaires could afford. Perhaps Gingrich imagines a vibrant Earth-surveying program that might help monitor climate change? No, probably not. Not content to merely colonize the moon in a decade, Gingrich has also promised to develop a viable Mars program to begin human space exploration of that planet within the next decade. It is hard to imagine why he didn’t also promise an intergalactic starship in this timeframe as well, as long as he was being visionary. Finally, Gingrich may not be aware that the current U.S. flags on the moon don’t mean we own it, any more than those on U.S. research stations in Antarctica mean we own that continent. But I suppose if one is willing to suspend reality to imagine creating an imaginary new expensive, and expansive, space program from nothing in a mere decade, without raising the taxes to do it, anything is possible. It certainly seems easier to imagine populating the moon in this way than actually solving the very real problems we face on Earth today.